Home Music News House of Yes & Caravan Gitane presents FULL SPECTRUM! House of Yes & Caravan Gitane presents FULL SPECTRUM! If you’re local to New York City or have dabbled in the ever-growing Brooklyn warehouse venue scene, chances have it that you’ve encountered House of Yes. It’s become a beloved spot, well known and well praised for the unique and outlandish performances that draw crowds in on a weekly basis. 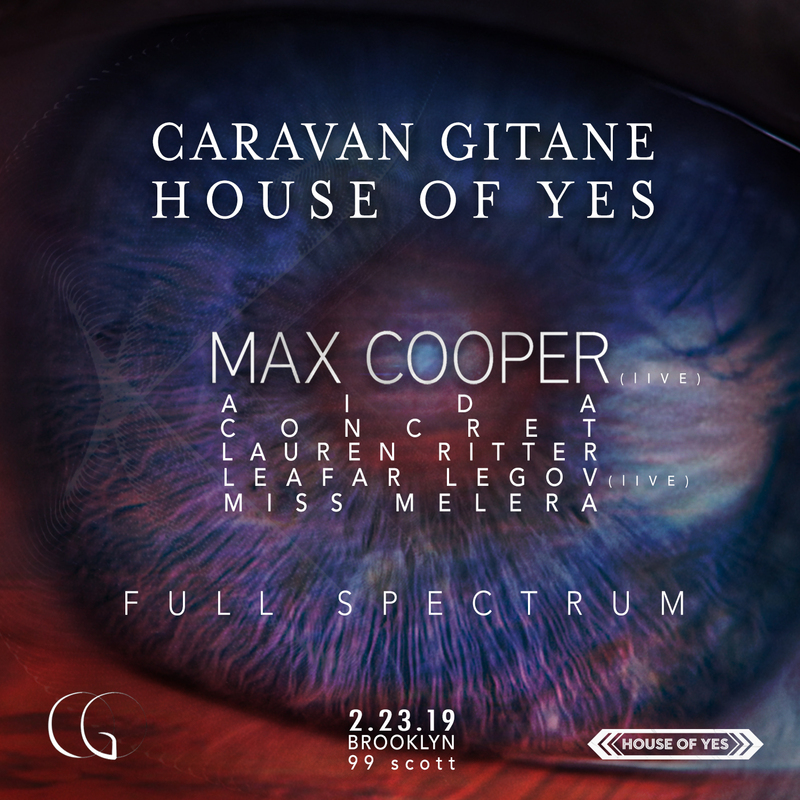 Now raising the bar and beyond, House of Yes will be joining forces again with highly coveted, Caravan Gitane, to bring feature presentation ‘FULL SPECTRUM’. Oh—and if you haven’t heard of Caravan Gitane yet, you’re going to understand exactly why this name has been rolling off tongues in recent years. With the perfect pairing of House of Yes and Caravan Gitane, FULL SPECTRUM is going to be a spectacle of an event. Both esteemed for their grandeur performances, the two will bring extraordinary elements of dance, theatre and cabaret all into one heavenly display. On this transcending night, attendees can find themselves in immersive performances revolving around living sculptures, aerial performances, geometric cosmic art by Gazoo to the Moon, and stunning audio-visual performances from a long list of talented artists. Of note, British producer, Max Cooper, will headline the event with music from his latest EP ‘Reflex’ and commemorate his NYC debut of his ‘One Hundred Billion Sparks’ live audio-visual set. Other performances will be supported by a line up of local and international DJs including—Aida, Concret, Lauren Ritter, a live set from Leafar Legov, and Miss Melera. While this festive event itself runs from 10PM-5AM, early birds can catch the live audio-visual pre-party set by Subhaze Studio. Clear your calendar for Saturday, February 23rd because it’s going to be a night of wonder. Check out the list detailing other featured DJ’s and art productions below. Click here for more information. Tickets are available now!